A BIG part of networking and a successful business is the ability to be “likable” in an authentic way. There is nothing worse than going to a networking event and meeting someone who is trying TOO hard to be liked. You know the type. They are overly bubbly, fake, and a schmoozer. So, how do you go about being likable in a genuine way? 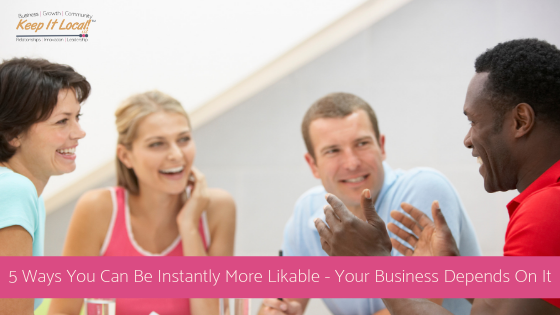 In this post we will explore 5 ways you can be more likable – your business depends on it! It’s obvious why being likable is so important. If people like being around you and talking to you, it’s only natural that they will feel comfortable with you. They will let their guard down and trust you. 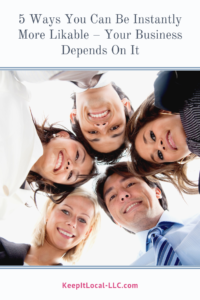 Once that trust is there, it is easier, more natural to do business with you. 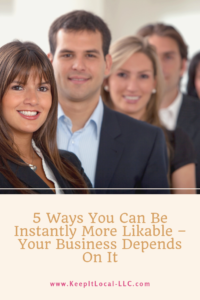 But, how can you be more likable in a natural way? As simple as that sounds, it makes a BIG difference. We’ve all heard the phrase “Resting B*tch Face” right? How far do you think resting b*tch face gets someone? Not very. A smile makes people feel comfortable and at ease and it makes you more approachable. You will make more connections with a smile! When meeting someone at a networking meeting or event, take the time to really listen to what the other person is saying. Listen more than you talk and ask questions to get a deeper understanding of who they are. Again, another simple, obvious thing to do. One of the sweetest things a person can hear is the mention of their name. It holds their attention in conversation because you took the time to personally draw them in, making them feel special by mentioning their name. When you meet someone for the first time, try to say their name at least three times during a conversation. This will help to imprint their name on your brain for future reference. In today’s world, we are so easily distracted by our mobile devices. It seems every five minutes our phone ring and ding with all sorts of notifications and reminders. When in a conversation with someone, mute your phone and stay focused on the topic you are discussing. Resist the urge to check your phone every 5 minutes. This is a BIG part of your personal brand. After you meet someone, people will remember the experience they had with you. How do you want them to remember their experience? Was it enjoyable, fun, challenging, warm, argumentative, relaxing, inspirational, intimidating, motivational, exciting, etc.? The way you speak, the body language you use, etc. leaves a lasting impression. Make sure it’s the right one. One of the best books to read about being likable and dealing with people is “How to Make Friends and Influence People” by Dale Carnegie. If you haven’t read it yet and you want to be well-liked, pick up a copy and put the techniques he teaches in to use!